It appears that the set I bought has the "new" wider black cartridge which will not fit in my HP C309 printer. I've slotted it into the wider "photo" slot and will get by but I need to know if you stock original slim CB316EE cartridges? Can I order black only from a cartridge set for the HP Photosmart C309? Yes, the multipacks are listed at the top of the page but if you scroll down you'll see the single ink cartridges. The HP Photosmart Premium C309 printer needs two black cartridges, a standard black and a photo black. These are known as HP 364 / 364XL black and HP 364 / 364XL photo black. The only difference between 364 and 364XL cartridges is the amount of ink they contain so you can buy either of these capacities for black and photo black depending on how much ink you need. You can also buy compatible black HP Photosmart C309 ink in black or photo black as a cheaper option to the genuine HP ink cartridges. Why are there two different sizes of black ink cartridge in my printer and do I need them both? One appears to be called 'standard' and is larger than the other which is referred to as' photo'. The two black cartridges perform different functions within the machine. You do need both installed in order for your HP Photosmart Premium C309 printer to operate. If these are recycled cartridges, do they negate the warranty on my Photosmart Premium C309 printer? They did on my previous HP printer. Printer warranty affected by recycled ink? As far as we are aware the use of remanufactured or compatible HP cartridges does not affect the printer warranty. However, to be sure I would consult the warranty information which came with your printer to confirm this. Do you sell printheads for the HP Photosmart C309 and how much are they? Unfortunately, we do not currently stock any printheads for the HP Photosmart C309 printer. I have two black inks in my HP Photosmart C309 printer. One is a bigger cartridge and I can't seem to find any for sale on your page? Your HP C309 is really a fantastic piece of equipment, and yet new cartridges can be a cost you are not prepared to spend. Trying to find matching ink cartridges tends to be a time intensive annoyance, most notably if it involves needing to drop by and get a hold of various kinds of businesses. Nevertheless, getting your hands on your C309 print cartridges doesn't necessarily need to be a stressful time. Get your HP C309 ink at Cartridge Save and you could get not simply energy, you will also find great deals! When you choose to place your order for cheap HP printer cartridges at Cartridge Save, you can be certain your most recent order is going to be delivered at your residential home or corporate address the following working day. HP C309 print cartridges ordered at Cartridge Save always are protected by a money-back assurance. If perhaps you've trouble, simply send us your goods for your full refund! Don't lose out when prices are so good! 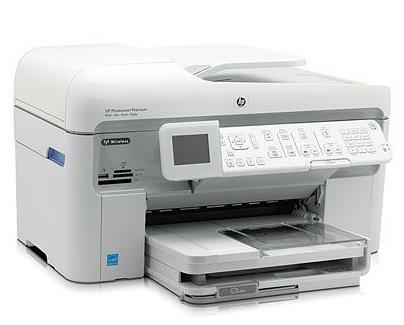 HP's Photosmart Premium C309 is an innovative multifunction printer that can copy, print, fax, and scan. Designed for personal and small office use, it is user-friendly and is equipped with extras such as separate photo trays and wireless connectivity. However, it lacks convenient features like the usual speed-dial buttons for fax transmission and a hinged scanner hood. Replacement inks for the Photosmart Premium C309 are on the expensive side. The HP Photosmart Premium C309 boasts an easy to access and streamlined control interface. It is designed to support a variety of memory cards, including Memory Stick Duo, CompactFlash, Secure Digital High Capacity Card, and Secure Digital / Multimedia Card. This multifunction printer features an ADF scanner and a flatbed. Optical resolution is 4800 dpi, upgradeable to 19200 dpi. Fax transmission speed can be as fast as 3 seconds per page (300x300 dpi). Copies can be scaled from 25% to 400%. A hardworking fax machine, the HP Photosmart Premium C309 has a large incoming fax memory that can take up to 90 pages at a time. Send faxes in as fast as 3 seconds. It also does a good job printing high-quality colour documents and photos. Additional perks such as ADF, double-sided printing, quick-access controls, Quick Forms, an integrated CD drive for custom prints, and separate photo trays also come with the Photosmart Premium C309. Wireless connectivity makes it possible to print directly without special USB cords. The HP Photosmart Premium C309 can only scan single pages at a time and cannot handle thicker objects because it lacks a standard scanner hood. The black replacement ink can get pricey, too.